At Repair and Restore we aim fulfill your every need in the way of home design and architecture, could a door and window repair help you? Whether you plan to keep the periodic look of your home and redecorate windows or opt for a full window spraying. Both can modernize and freshen the appearance to bring it up to a more present or periodic look we will be able to with what you're aiming for whether it is, plastic, aluminum, or timber. Older window systems need servicing and are more energy-efficient than windows manufactured and produced in past days saving you time and saving your money on utility bills. But modern windows systems can severely interfere with a homes appearance. Here you will find examples of all the different types of repairs that the restoration team can make to your damaged doors and damaged windows. We also do a door and window replacement service as well as repairs as customers in the past have made a request to us for this service. On the odd occasion doors or windows are to severely damaged, a cost-effective option for customers is to have us repair the damage, leaving the customer with no other choice but to have a direct replacement, also people have asked us as they know and trust our us and are sure that the end product that Repair and Restore is the utmost highest quality. We repair all types of damages to doors and windows whether they are scratch, dented or chipped, or need a full spray. We have even repaired entire corners of doors and windows where a section was missing or lost. No matter what color, what style profile or material, whether your windows or doors constructed from aluminum, plastic, or aluminum we can repair on site and make the damage disappear making the repair stronger than the original surface. Cracks, from stress and poor installation. Chips from accidental damage, possibly from debris falling from scaffolding. 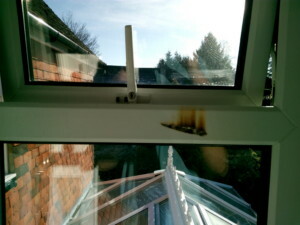 Repairing Burns in plastic window frame surface from cigarette burns, angle grinding and even mirrors. Split window sills from impact damage, vehicles reversing into sill and damage from falling objects. Holes in the frame from the removal of old cables and window fitter errors. Wow the worktop looks great, I can’t even see the repair. Will be recommending your services in the future. Thank you for the invoice Lance. I would like to share my gratitude of a job well done. The shower tray looks amazing and saved us over £1000. You carried out some shower repair work for us at Quadriga building in Reading, I would just like to say the repaired shower tray is simply amazing, you really saved our skin on this one, the client is happy to move forward. Thanks for your great work on the granite worktop yesterday much appreciated. Its saved us our deposit on the House.